This lesson builds on lessons from the Expressing Feelings theme and creation of the Caring Being to help students make their classroom and school a Ridicule Free Zone by writing a Constitution of Caring. Research shows that thinking compassionately about other people not only makes you happier, but also healthier. A commitment to caring is a choice that young people can make and a discipline to practice in your classroom. You can help support this by building structures that support kindness, such as creating with your students a Ridicule Free Zone class (and school!) and a Constitution of Caring. You can also positively reinforce caring behaviors by noting them when you see them. Kindness also feels good. Take a “Feelings Temperature” as a way to help young people notice how their caring acts and support of one another shifts their moods in positive directions. Having a Ridicule Free Zone does not mean that ridicule, name-calling, teasing and other disrespectful ways of treating one another will magically disappear overnight. Make commitments to a Constitution of Caring. Take a Feelings Temperature before beginning. Have each student record his or her answer. Carefully assign each student someone else in the class. Have each student write a put-up on a strip of paper and decorate it using art supplies for that friend. The students will then fold their strips of paper and put it in the plastic egg with the name of the person they wrote the put-up for written in glitter glue or with a sharpie. Remind students that put-ups are positive statements we make to one another. Some possibilities might be: “I like you just the way you are.” “You help solve problems on the playground,” “You always help out when someone needs something.” The put-ups should be as sincere and specific as possible. Have students exchange their eggs and read their put-ups. Take another Feelings Temperature. Summarize students’ comments. Share with studentsat research shows people who are kind and compassionate to others report feeling happier and are healthier. What’s one thing that we’re doing well to act as Caring Beings? What’s one thing that we still need work on to act as Caring Beings? Do you feel our classroom is a “ridicule-free zone?” Is our school? If not, what is keeping it from being one? Why might creating a ridicule-free zone be helpful? Discuss what it means to have a Ridicule-free Zone (RFZ). If your classroom or school is free of ridicule, what does it have instead? Brainstorm a list of qualities with participants. “A way of thinking about our class community of caring more deeply is to think of it in terms of our rights like the way the Constitution of the United States is written. Explain that the Constitution is a group of agreements that was created by the founders of the United States in 1787. Break your class into small groups of 3 or 4 children and give each group chart paper. Give the groups five minutes to brainstorm agreements they can make to create a ridicule free zone in your classroom where everyone acts as a Caring Being. At the top of the chart paper, have students write: “We, the class of X, in order to form a ridicule free classroom promise to. . .” Circulate among the groups helping children to reframe the statements as agreements as needed. This will become your Class Constitution of Caring. When students have finished, have each present their ideas to the larger group. When you are finished, have the students read it out loud, taking turns reading each line. 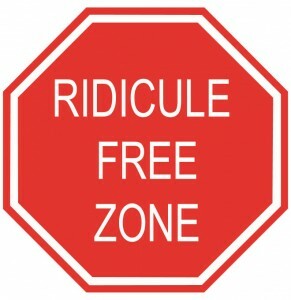 Have students in pairs create Ridicule Free Zone signs to decorate the classroom and halls of your school. What words do they want to put on their signs to remind them of the rights they have in your classroom? Put one RFZ sign prominently on your classroom door. Sing “This Little Light of Mine”—our theme song for the “Building Community” theme. With the song playing softly in the background, ratify your Constitution by having all of the students sign it. If you have access to a prop like a quill style pen, this might be a way to make the ceremony feel special. Post your Constitution where everyone can see it. K-1: Take a Feelings Temperature before starting the gathering. For the gathering, give pairs of students a half sheet of paper. Give students a few minutes to write or dictate a compliment for that person. Call time and have students share what they have written. Take another Feelings Temperature after the activity. Point out any changes in students’ feelings you notice. Do the main activity as a group, using one chart in the front headed “We, the class of X, in order to form a ridicule free classroom promise to. . .” at the top. Elicit any background knowledge students may have about the United States Constitution. Explain, simply, that the Constitution is a group of agreements that was created by the founders of the United States in 1787, and that our country still has this group of agreements. Share the preamble of the Constitution “We the people of the United States, in Order to form a more perfect Union, . .” and tell students their classroom constitution will begin in a similar way. Show them a chart with “We, the class of X. , in order to form a ridicule free classroom promise to. . .” written at the top. Follow the lesson as written for the rest of the activity. 6-12: Follow the instructions as listed, but instead of the “Ridicule Free Zone” solicit ideas from your class for what to call your classroom, using the RFZ as an example. For the integrated arts portion of the activity, have students in pairs pick different ways to communicate their RFZ. One pair can make a poster; another write a rap; another write a PSA; another create a short video with cue cards and a favorite song, etc. K-1: Art and History: Explain to students that when the U.S. Constitution was written in 1787 there were only thirteen states. Read Betsy Ross by Alexandra Wallner. Give students art materials (red and white construction paper, one color cut into strips, blue rectangles, white crayons or paint) to create their own original American flag. Discuss: why would it be important for there to be a Constitution or set of agreements for these thirteen states? K-12: Literacy, Drama, and Social Studies: Have students memorize and recite the preamble to the Constitution, as if they were trying to convince their peers to adopt it/agree with them. Ask students to consider the emotions (as actors do) of the people who were writing and adopting the constitution: what did they care about most? Grades 2-5 Literacy and History: Books such as Shh! We’re Writing the Constitution by Jean Fritz and If You Were There When They Signed the Constitution by Elizabeth Levy are excellent launching points for teaching about the U.S. Constitution. Grades 2-12 Literacy, Civics and History: Explore with students the Preamble to the Constitution of the United States: We the People of the United States, in order to form a more perfect union, establish justice, insure domestic tranquility, provide for the common defense, promote the general welfare, and secure the blessings of liberty to ourselves and our posterity, do ordain and establish this Constitution for the United States of America. Create a chart separating the individual ideas (establish justice, promote the general welfare, etc.). Assign students to groups of 3-4. Give half of the groups Handout 1 and half of the group Handout 2. Have students work with their groups to discuss and record what they think the three ideas on their papers mean. Come together and share ideas. Record ideas on the larger chart. Grades 2-5 Art, Civics and History: Divide class into 6 groups. Have groups choose one of the ideas from the preamble of the Constitution to illustrate. Give students mural paper, black waterproof markers and paints (gauche watercolors work well, if available). Have students illustrate their idea incorporating the text as part of their mural in their own way. 6-12 Literature: Explore the role of insiders and outsiders in literature. What societal norms, values, rules and structures support these dichotomies? What is the price of these norms, values, etc. to individuals? To society? While nearly every novel has characters that relate to this theme a few good options include: The Bridge to Terabithia, The Great Gatsby, The Outsiders, and To Kill a Mockingbird. Grades 6-12: Media Arts/Literacy: Have students create an RFZ or anti-bullying video. In it, have them explore messages that help your school become a place where it’s safe to be different and to be yourself. Show this video or another more representative of your classroom as a way of getting the conversation started. Grades 6-12: History: Debate the role of republicanism as it is presented in the Constitution. Should public policy be created by the majority or by representatives of the majority who are better informed? How about the public policies of your school?